The quality of leather for the automotive industry starts from the wet-process. FGL International knows it well. 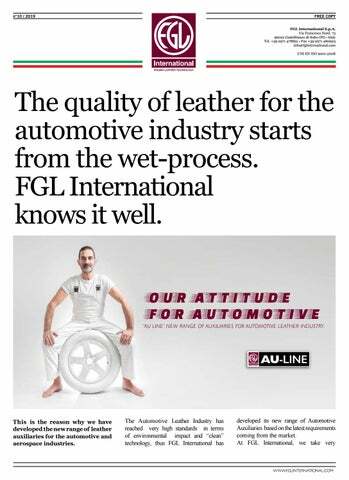 OUR ATTITUDE FOR AUTOMOTIVE ‘AU LINE’ NEW RANGE OF AUXILIARIES FOR AUTOMOTIVE LEATHER INDUSTRY. This is the reason why we have developed the new range of leather auxiliaries for the automotive and aerospace industries. technical staff is ready to give all our clients worlwide all the support in achieving outstanding results through the best application of our new AU line. NEW RANGE OF AUXILIARIES FOR AUTOMOTIVE LEATHER INDUSTRY. Ecological Sustainability. Just for this reason, given the importance and the actuality of the issues covered by the conference, FGL International has decided to present its own study realized in collaboration with the CNR of Sassari entitled “Circular Economy: the Green Way for Tanning”. protect consumers, workers and environment. working on this task in a collaborative and open manner. Auxiliary chemical tanning products with a high added value. PRODUCTS FGL International produces a full range of innovative and effective chemical products for tanning, re-tanning and dyeing. FGL International’s production plants, directly connected with its highly technological R&D labs, have enabled a rationalisation of production processes and ﬂexibility, the key tools for rapidly responding to individual needs. Specialised technicians verify product quality throughout the production process to ensure that the high quality standards provided for are complied with. Productions plants, warehouse, experimental tannery, Research & Development, our qualified technical support etc. 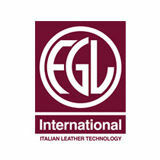 The revolutionary tanning process, designed and produced by FGL International so as to increase the production eﬃciency of tanneries whilst safeguarding the environment. THE FUTURE STARTS NOW. Discover our new ‘AU line’ for Automotive industry.